This year's M.O.M. 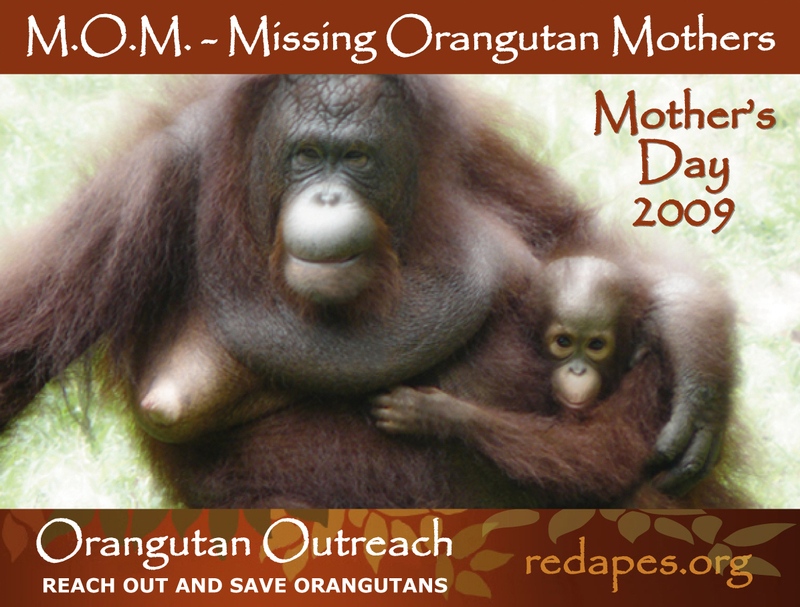 banner features orphaned orangutans Valentino, Yutris, and Momot. 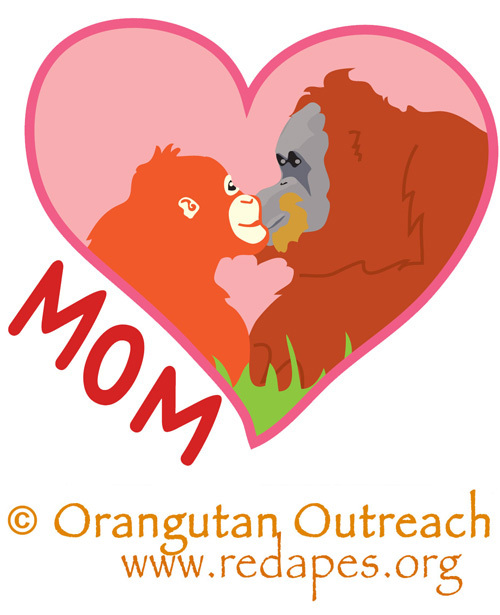 They are three of the hundreds of orangutans who attend the BOS Foundation’s jungle school at Nyaru Menteng in Borneo. They are learning skills that one day will enable them to live as wild orangutans. All three star in the new series Orangutan Jungle School. All donations from our M.O.M. campaign will be allocated to BOS Nyaru Menteng for the continued rehabilitation of Valentino, Yutris, Momot and their friends! Check out the Orangutan Jungle School Facebook Page! The version below is optimized for Facebook. Please download the banner and add it to your Facebook page and other social media. It has been optimized specifically to fit Facebook pages! All we ask in return is that you link back to our M.O.M. campaign page. If you would like the images in higher resolution, please contact us. More banners in different dimensions coming soon! 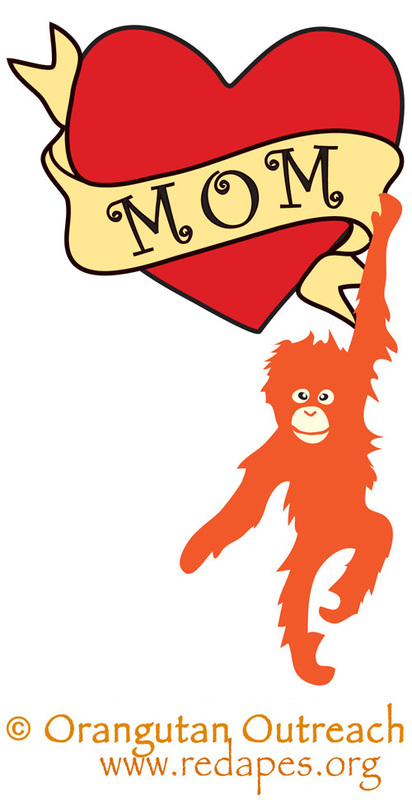 What is the MOM Campaign? 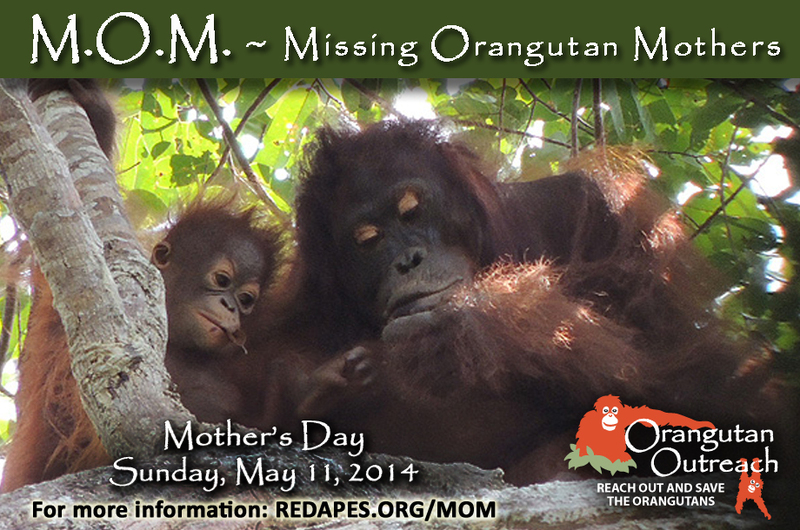 Mother's Day is the perfect day to celebrate and pay tribute to orangutan mothers. The M.O.M. – Missing Orangutan Mothers Campaign is our way of doing precisely that! The M.O.M. Campaign is a positive way to bring attention to the crisis facing these beautiful red apes by encouraging people to help protect them. Orangutan mothers and babies have an incredibly close relationship. Baby orangutans don't have a support network around to give them the many lessons of finding food, building nests and other survival skills. Their mothers teach them everything about survival in the forest before they set out on their own. 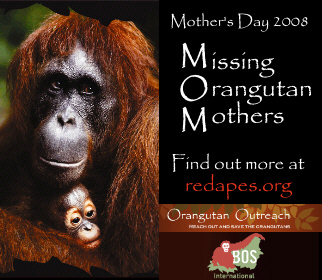 Because of the growing demand for palm oil, though, more and more orangutan mothers are being killed every year on the islands of Borneo and Sumatra. 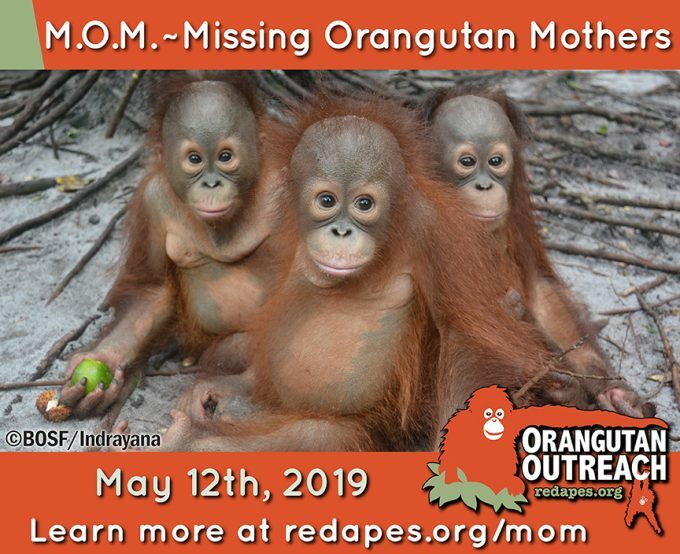 The orangutans' rainforest home is literally being wiped out to make way for oil palm plantations— leaving hundreds of helpless orangutans with nowhere to go. 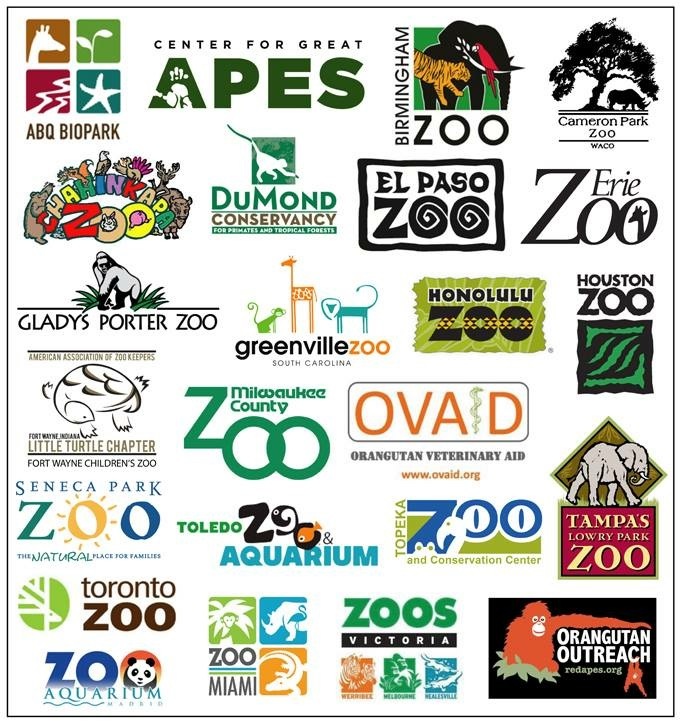 Some of the lucky ones end up at rescue and rehabilitation centers and are cared for by a trained, professional staff. 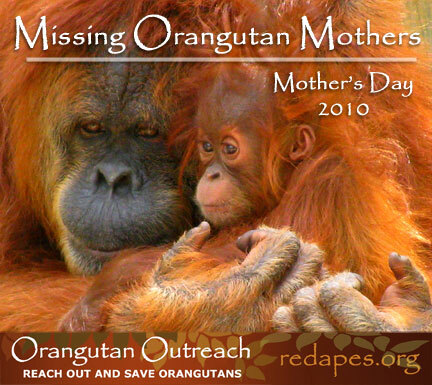 Orangutan Outreach works with professional organizations such as the Borneo Orangutan Survival (BOS) Foundation, the Sumatran Orangutan Conservation Programme (SOCP) and International Animal Rescue (IAR) to care for more than 1,000 orphaned and displaced orangutans until they can be returned to the forest! 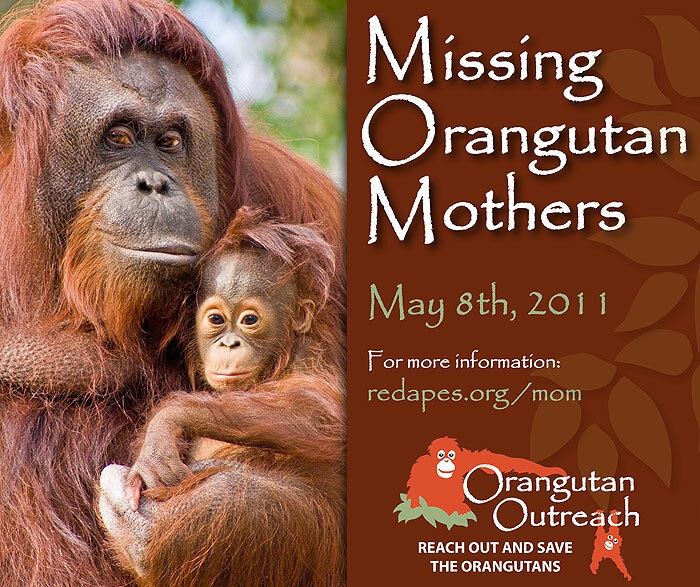 That's a lot of missing orangutan mothers! 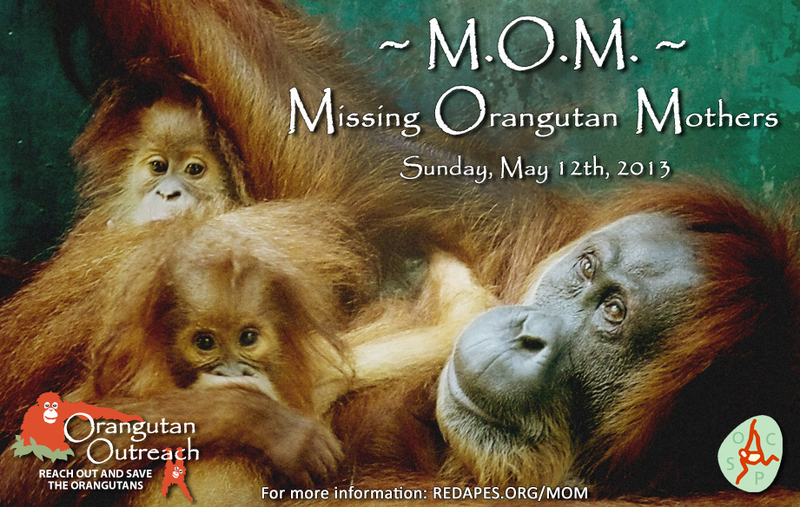 This Mother's Day, we are asking zoos, sanctuaries, animal facilities, groups and individuals all around the world to participate in our M.O.M. Campaign and hold their own events. These events can be as elaborate or as simple as you'd like. It's up to you! 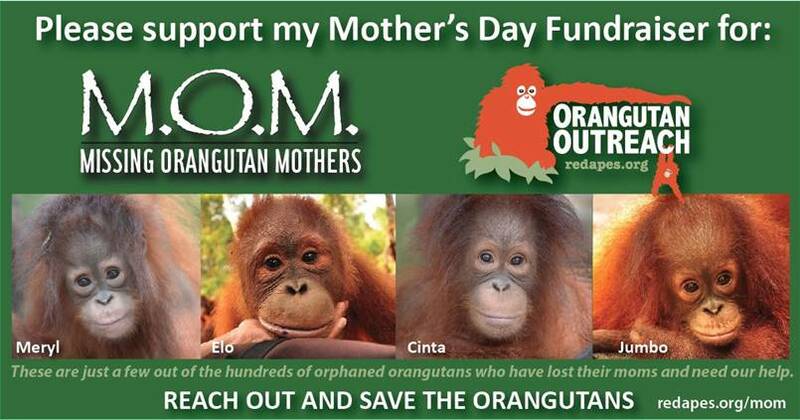 You can directly support BOS Nyaru Menteng by adopting Jumbo, Cinta, Meryl, Topan or Jelapat. These amazing drawings by our artist-in-residence Alina Bachmann are designed to be tattoos. 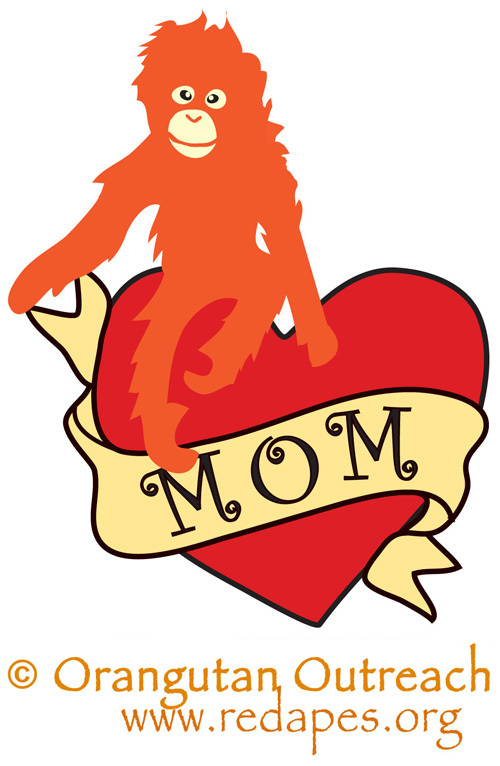 If you'd like to participate in our Mother's Day event, please let us know. We will do our best to help you in every way possible. We want to stress that this not specifically a fundraising campaign. 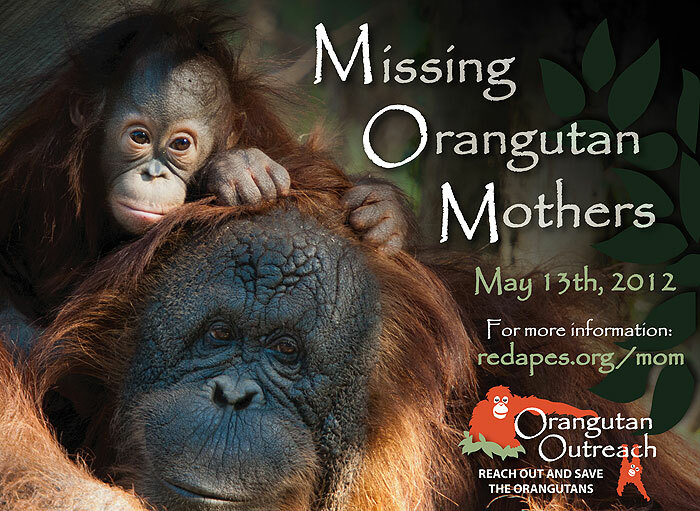 The goal is to raise awareness that orangutans have been pushed to the brink of extinction in the wild and that if we don't act now to save them, they will be extinct in less than a decade. 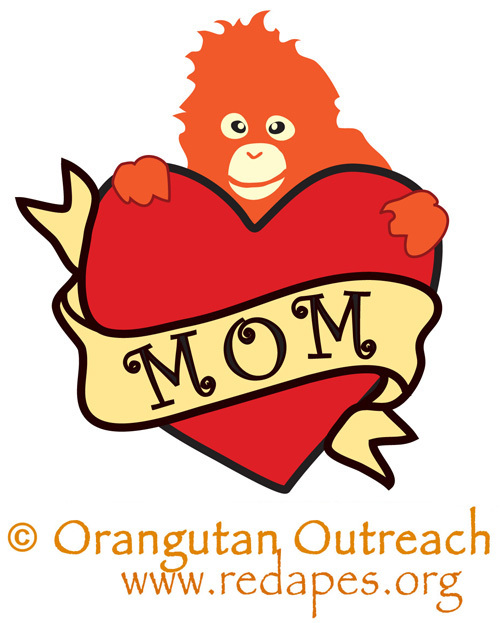 HOWEVER, if a collection jar is put out or you choose to include a fundraiser in order to make a donation or adopt an orphan orangutan through Orangutan Outreach, we would, of course, be thrilled. (We are a tax exempt 501(c)(3) non-profit organization.) Why not raise funds to adopt an orangutan for your own institution or group? 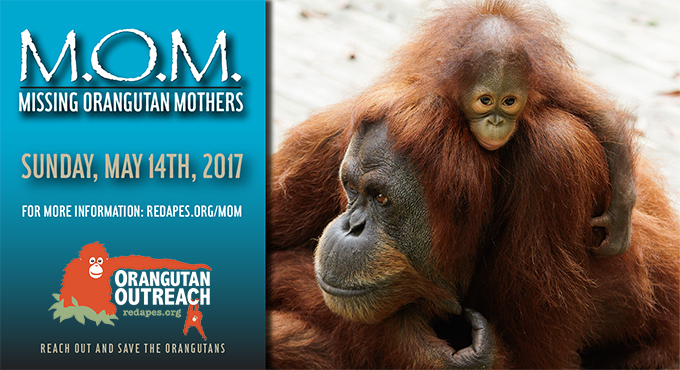 This is a great way to follow the life of an orangutan & stay involved with the tireless work being carried out at the rescue centers! Guidelines - If you have a M.O.M. 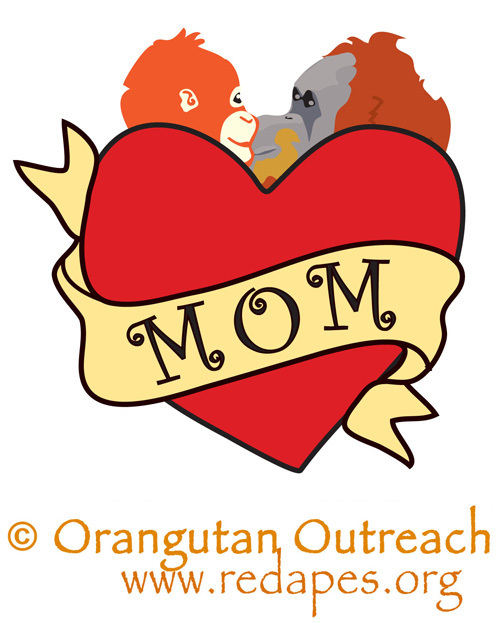 event, we ask that you please mention Orangutan Outreach and encourage your visitors to go to our website to learn more about orangutans and what can be done to help them. We also ask that whenever possible you please mention the projects and groups we support, such as IAR Ketapang and BOS Nyaru Menteng, SOCP, COP and OIC. 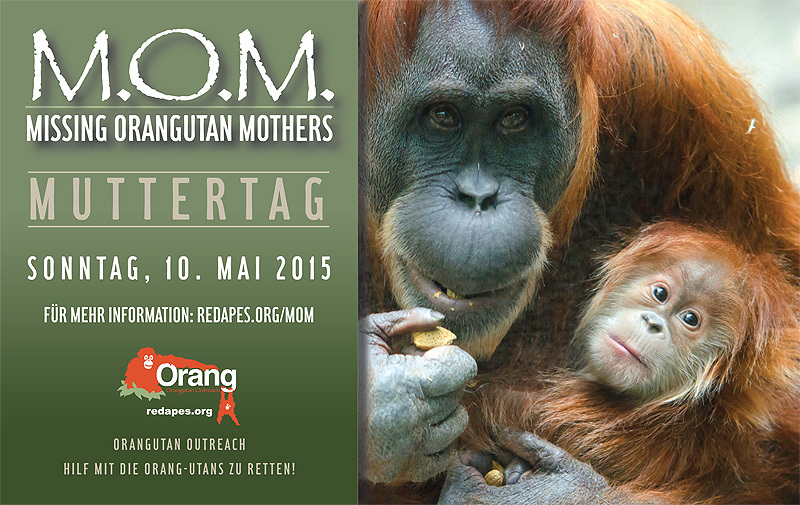 We would love for zoo visitors to feel inspired so that they go home, log onto our website and adopt an orangutan! But there are no obligations or expectations. 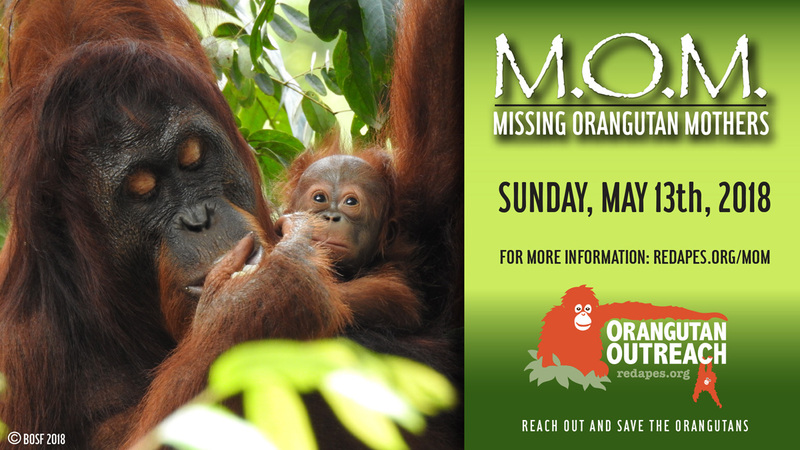 This is primarily an attempt to raise much needed awareness of the crisis facing orangutans in the wild. 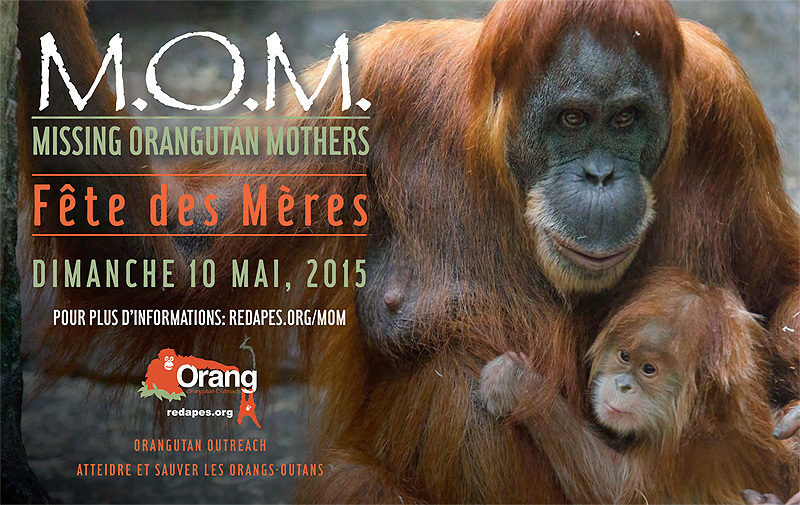 Lots more information, display files and event ideas can be downloaded at Orangutan Aware. MOM Campaign Video: Baby Orangutan Bonanza!